Ceremony Planning – special music, readings, candle and many more options. 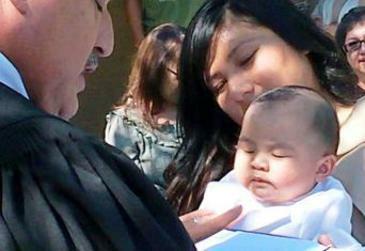 A child baptism is a celebration of the birth of your child where the parents dedicate their child to God and promise to raise them in their specific religious faith. Rev. Ron is available to perform your child's baptism in your home, hall, venue any North Carolina location. He has been ordained for 30 years and served as a Pastor for 35 years. For more information about what takes place during the ceremony and its signifigance please read our Child Baptism-Frequently Asked Questions. The role of the Godparents or Sponsors is to provide special assistance and encouragement to the child and the family in their spiritual journey. You may or may not wish to invite people to serve as Godparents/Sponsors for your child. Godparents or sponsors must believe in the Christian/Catholic faith and need to be present at the baptism and will stand with the family during the Sacrament. They may wish to provide a special baptismal gift of a meaningful and permanent nature such as a silver or gold cross, the child’s first bible, or a baptismal bowl to be used by the minister in the baptism service. Call or email Rev. Ron to discuss his availability for the date, time, location and details of your baptism. Once availability is determined you can go online to confirm your date by paying a $100 non-refundable deposit. Should you cancel you have up to one year to reschedule your ceremony. We accept most major credit and debit cards through PayPal. Once your deposit is received your date and time is confirmed and you will have unlimited phone and email access to Rev. Ron to assist you in the planning of your child’s baptism.